rowed and patterned. Winter thunder startles. to quarter in spring’s germinal unfolding. This is a new word in my vocabulary – discernment. It sounds so serious, and yet there is a beauty, almost an echoing exhale and resting inside, deep down. Exactly what it means. There is a calm that sweeps over me when I think about it. I relax. Odd, I usually don’t do that when I have to make a decision. But using the word discernment seems to assure me that I don’t have to hurry. I can take my time. The answer will come if I quiet my thoughts and listen. However, putting myself into discernment doesn’t mean I will be lazy and expect that through some magical voice the answer will arise. Discernment is active. I have things to do, been given, because I asked. I usually panic here, also. But that’s not what I hear now. A little over a year ago I started Passage Meditation. Small changes happened, almost imperceptibly. The most important thing that happened was when the first realization bubbled to the top and asked, “Did you just see what you did?”, it wasn’t in judgement. It was truly a voice simply asking if I noticed. And the next time, or maybe a few times later, my thoughts echoed along with the voice, “I saw what I just did.” And maybe, down the line, and only once or twice in this year or so, my voice led, “I know what I am going to do.” And thinking the better of it, I didn’t. 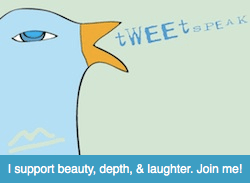 So with this new awareness opening a place inside, deep down, I sink into discernment. I quiet myself to listen. I take up the tasks to complete and not judge. I am at peace with waiting for the thaw. from winter’s last exhalation on the loam. His avowal of spring awaits. We walk on slippery ground. We hear voices calling to us, but which one to choose? Ego must stand aside, make room for spring. We pass through darkness, but there is light, always. We enter, fragile, easily broken. But His warmth is promised. Blessings. love are buried so deeply under daily agenda. hear his call, let him cradle me, his beloved. I am not a fisherman. My study of the Gospel of Thomas took a break through the Advent and Christmas seasons followed by my project with Brigid of Kildare and Imbolc. With Lent looming, I decided it is time to return to Thomas for a bit. I am on Logion 8 and the image of fishing left me cold. I attempted it, the logion not fishing, a while back during a small breath of space between the two seasons. I was stumped. (8) And he said, “The man is like a wise fisherman who cast his net into the sea and drew it up from the sea full of small fish. Among them the wise fisherman found a fine large fish. He threw all the small fish back into the sea and chose the large fish without difficulty. Whoever has ears to hear, let him hear. I decided to approach Logion 8 one more time through Lectio Divina on my cleared-off couch. If you would like to read the others poems in my study, click the titles below. Or you can also visit all of them on the Theophany page. against earth’s grip to join in your dance. I had the pleasure of meeting a saint, a goddess, unknown to me only a few weeks ago. Fr. Scott Jenkins asked me to do the homily for our monthly Celtic mass as St. Brigid of Kildare. The mass would take place on February 1, Brigid’s feast day and Imbolc. It was a whirlwind three weeks. Research, writing a script, addition of a baptism at the mass (oh, so appropriate! ), making a costume, rehearsing, and regular life chores of a first grade teacher, wife, and caregiver. The homily was a transforming experience for me. My church, A Church of the Holy Family, is a place of loving and wonderful people who accept all. We are part of the Ecumenical Catholic Communion (ECC). I am only a member for slightly over a year, but have been embraced and my gift of writing and acting has been encouraged and honored. I cannot have found a more welcoming home. Also, I found Brigid, a saint and goddess I will treasure. I was lucky to have gone on a private silent retreat during this time at the Sacred Heart Jesuit Retreat House allowing me time to explore Brigid and Celtic spirituality in some depth. I find that Brigid is leading me in a discernment process right now. I wake to her blessings each day. And I not only discovered Brigid, but was also connected to an artist through a dear friend, C.J. Prince, a writer who lives in Bellingham, Washington. The artist, Joanna Powell Colbert, was creating this new portrait of Brigid at the same time I was creating the homily. 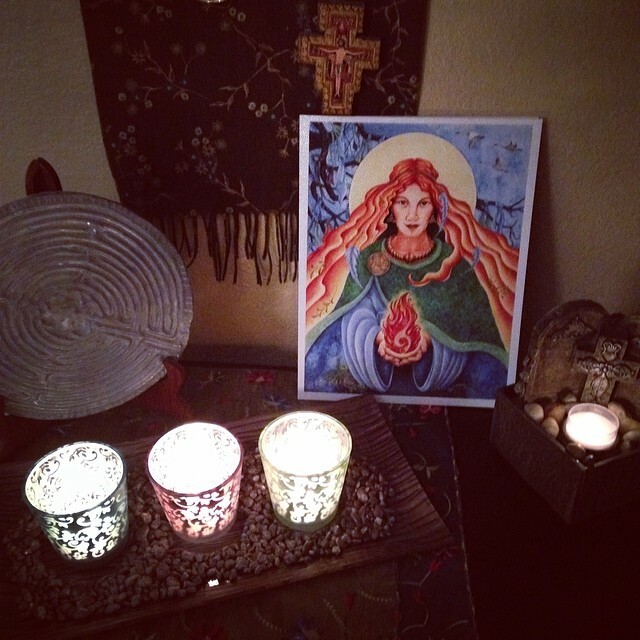 A print of Ms. Powell Colbert’s Brigid’s Fire now resides on my mediation altar. 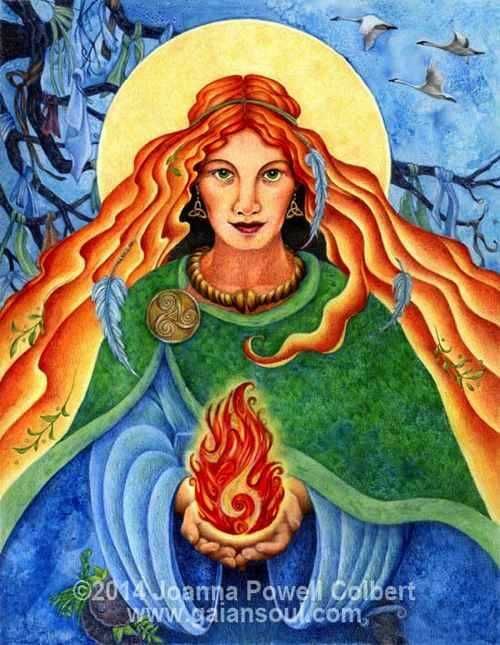 Please visit her site to see Brigid’s Fire, other beautiful work, and a blessing for Imbolc, the beginning of spring. It is hard to believe all of this happened in a few short weeks. It is the beginning of what I hope to be a good journey.